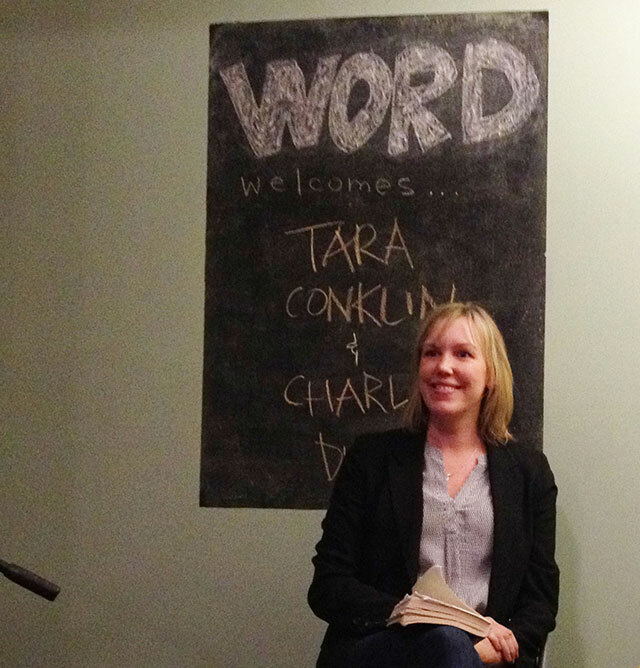 Tara Conklin read along with Charles Dubow. Because of the length of the event, it has been divided into two parts. The write up on Charles Dubow wcan be found here. Tara Conklin’s The House Girl follows two divided narratives — part historical fiction set in 1852 Virginia and part contemporary novel set 2004 New York. The narrative switches between an escaped slave and a young associate lawyer. She read at WORD Bookstore with Charles Dubow. After reading briefly from both the historical period of the novel and the contemporary modern section, WORD’s Jenn Northington begins a discussion by asking how the novel came about, and whether she had written other first novels before finalizing this one. There was another novel that Conklin had started writing, she says, but she had to stop because she thought it wasn’t very good. The process of novel writing intimidated her too, and so when she began working on what would become The House Girl, she never called it a novel. When she referred to it, she called the stories “my writing project.” There is a sense that she spent a lot of time hiding her writing. “I think if I said I was writing a novel, it would have been awful,” she says, because it would have been a bit overwhelming. Instead, The House Girl began as a single story, then grew into several, and finally into a novel. Conklin, anticipating the question, “how did you get your agent?” and then disappointed when Jenn Northington doesn’t ask, jumps in to tell the audience: serendipity. First, Conklin explained, she created a process to find her agent: one agent at a time with lots of research. Each agent she meticulously read up on and wrote specific queries to. And she says she got lucky — the woman who eventually came to represent her just happened to be checking her email at the time her query came in. Her persistence researching agents paid off. She liked many of the same books her agent listed as enjoying and mentioned these in her letter. Ultimately though, she concedes it came down to luck that her agent happened to be reading the inbox at the time. While finding an agent can seem daunting, so is finding the time to write when employed at a full-time job. Conklin explained now she writes when her children are in school, and sometimes after they are sent to bed. The children have a strict eight o’clock bedtime. But when she first began her writing project–the stories that would become The House Girl, she was a full time lawyer. She jokes that the best part about writing a novel is that it looks as though you are working even if you are secretly writing. Conklin spent five years working on the novel, although during the first three years she still believed she was writing stories that were mostly meant for herself. Asked if she would have done things differently if she could go back, Conklin says that other than her debt from law school, she doesn’t regret having endured an alternate route. “An MFA would have killed me,” she explains, saying it would have felt claustrophobic and competitive, and ultimately would have been bad for her writing. “I knew in the back of my head I wanted to write,” she said of her childhood, but really, if she had been writing when she was much younger she isn’t sure what she would have written about. “What would I have written about at 25?” she asks. Now she is seizing the day. She has ideas for four novels that she wants to write. Though the novel began as short stories, once she decided to turn them into a novel, she knew that she wanted parallel narratives. She wrote the historical sections first–those were the story projects she had been working on. The modern day sections came after she made the decision to write a novel. She sees the split narrative as a way to add richness to the story.